I am not a religious person, but I am spiritual, and trying to be alert to the spiritual around me these days. I have some distractions that immediately make me either be fearful or think negatively. I don’t live in a vacuum, so protecting myself from the unpleasant by isolation isn’t an option. One of the ways I am attempting to be positive is by trying to stay in touch with my spiritual beliefs. When someone asks me to pray for them, I do it right then. I learned to do this from my friend Claire, who confessed to me about thirty years ago that she prays right away for requests because she is afraid that if she doesn’t, she’ll forget. This technique has worked for me over the years, especially now when my memory seems to be fading at record speed. Something that I am learning from my friend Jill, is to make sure that I set aside a time for the spiritual and don’t leave it to chance. The night hours don’t always work well for me because, face it, when you get up at four in the morning, by the time night falls, you’re tired! So I try doing my altar time or meditating in the morning. Or if is nice out at dusk, I might light a fire in the fire pit and sit outside on our patio at the edge of the ravine. It is dark and quiet out there after the sun sets and if you are very still, you can hear the animals moving through the forest. My friend, Betty and I have birthdays within a couple of days of each other and when we turned sixty, we noticed that suddenly we were both being led to say no more often, and to not do anything that we didn’t want to do unless it was absolutely necessary. We try not to be coerced. Now that doesn’t mean that we don’t try to do everything we can when a friend is asking for something. But it seems like we are both able to resist being manipulated. Our inner voices are coming in loud and clear. Sedona, Arizona is considered a very spiritual place, and I believe that this area in west Michigan, especially where we are right at the edge of the ravine, is very spiritual. So many things have occurred that are blessings! My Aunt Von told me yesterday to pay attention. She said that so much that we experience is our intuition, or something from the outside coming to guide us. In different instances lately, I know that my mother is giving my sister, Liz and I her wisdom. Or I feel her support. My intuition has grown by leaps and bounds. I believe this is due to using it and not ignoring it. You can get all the advice in the world but if you don’t recognize it and put it into use, it isn’t going to work. So I am working at considering ideas that come to me and investigating their source. Not every single thing needs to be put into play. Something wonderful happened this morning that is a combination of blessings and an answer to prayer. I have written before about Jim and I sitting in our kitchen, watching birds and wildlife in our back yard. This morning I was deep in thought, and a large bird flew from over our roof and swooped into a tree. I thought it was a big hawk or even an eagle, which we have. And then its head swirled around and I saw that it is an owl! I love owls! I have been hoping to see one since we moved here. Suddenly I thought, this is no coincidence. The owl has come here for me. I quickly got out my books and found that Athene is the goddess of communication, the patron of writers and that her totem is the owl. I can’t describe how thrilling this is to me. I think my mother sent the owl. So while she is here looking at me, I might add, I am going to say my prayers for my extended family and all my friends and just enjoy being in the presence of such a fabulous creature. This entry was posted in Goal Setting, Growth, Prayer, Spiritual Life by Suzanne Jenkins. Bookmark the permalink. 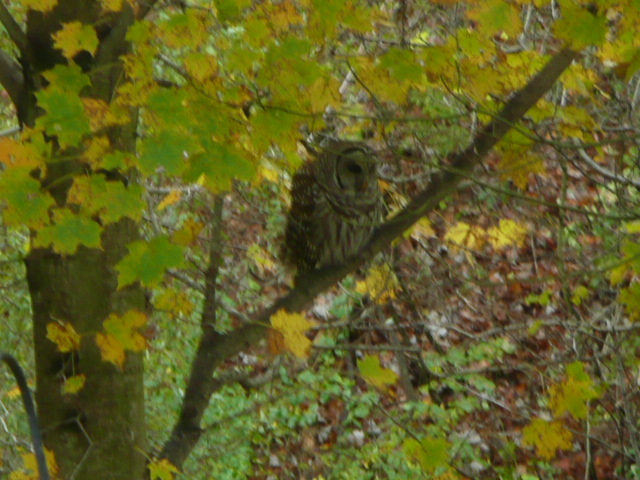 The owl is lovely, so glad she came to visit you….I am trying to stay aware, spiritually, every moment. Things don’t always come to us as we would expect, we need to keep our minds and hearts open, even in our dreams..and I totally agree about the praying, do it often, especially when people make special requests!! Congrats on your encounter, you must be thrilled.